You have to keep in mind that the king is completely isolated from all this. He has no knowledge of what is going, nor does he wish to know what is going on, because of the Prince's death. Hence why the whole country of Brune went to hell thanks to Dukes Tenaldie and Ganlon's maneuverings for the throne. Lol seem like having useless kings is needed for the story >_> Even Ellen's king is afraid of their power and try to prevent them from expanding their territories, rather than trying to make use of the power they have. I wouldn't say Viktor's fear is unwarranted, and even Limalicia points this out in Volume 2. Seven retainers who each hold prestige and positions directly beneath the king, each of them holding power equivalent to a thousand knights, all with their own goals and agendas? Definitely enough to make most leaders tremble and cower with fear and paranoia. Tigre's response to the hypothetical question posed to him, however, was just hilarious. Brune's king, however, was completely useless, even before the loss of the Prince. He did let the Dukes Tenaldie and Ganlon run amok with their territories, and basically split up the country among themselves for their own self-interests. "I will pass the work to the seven of them, then I'll go take a nap or go hunting"
Which earned him a smack right upside the head from Limalicia. Hahaha. Speaking of the Vanadis, I'm completely looking forward to the last one, Olga. Olga is the seventh and yet-to-be-revealed Vanadis, who is wandering around. I'm completely curious as to how she looks, how her personality is, what her motivation might be, and what her weapon is. At least Lim's hobby came in handy near the end of Volume 2, for triggering Lyudmila's flag! Hahaha. You mean the grand battle with Roland? Now I'm definitely stoked. That battle was badass. It was a classic face off. Volume 1 and 2 are good, 3 is better, and 4 is at another level (the battle against superior odds). 5, which is the conclusion to the first arc, looks just as good. I swear, once I get to that part, I am so blasting Nenshou Kairou loudly off my speakers. Again, that's what I love about this series. Every action has consequences, whether intentional and unintentional, that play out in the big picture. ^ THIS. THIS SO MUCH. It's the fact that nothing happens in a vacuum that makes you feel like this world really is a living and breathing world. You also gotta love how these consequences don't just get mentioned at the end of a volume and occur at the beginning of the next. It's not like set pieces merely meant to transition into the next book release. They also occur right as the story unfolds during the middle of the book, making the whole world feel more alive, that everything is connected. Easiest examples would be, in Volume 1, Tigre's capture alone; in Volume 2, Donalbane's band of thieves. I have been following this LN for awhile and glad to see this show up in the forum now ^^. Ya those transitions were done quite nicely ~_~ kinda give off a different feel from those other novels which end in one vol and a whole new story start on the next one, not that there's anything bad about it. It's intimidating but I would say it's a well-built series. It has a lot of solid history, concepts and background surrounding it, and you'll need to understand all of those while reading Horizon. That's probably why a lot of people are intimidated by it. Plus, THEY'RE HUGE (the horizon books start midway through). It makes the story into something dynamic, something that reacts to every character's actions and inputs, rather than something constant. A constant story to me is something akin to a play, where all the characters act out predetermined roles and actions. I'm not arguing that one is superior than the other; it's more out of personal preference that I like reading a dynamic story. Getting close to finishing Volume 2 now! Finally reached the part where Eleonora and Lyudmila marched their armies. 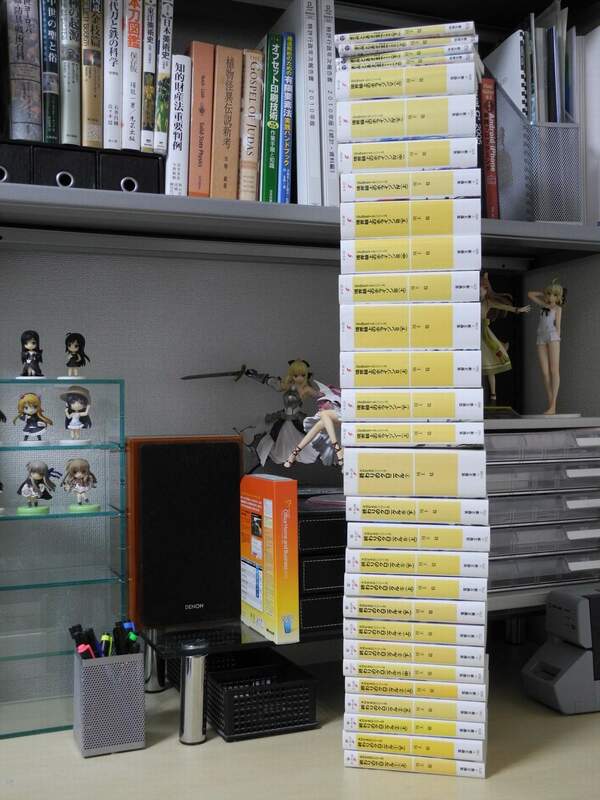 Yeah, that really thick one in the middle is Owari no Chronicle's final volume. It's a precursor to the world of Horizon.